The wait is finally over! 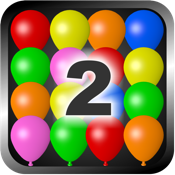 Sequel to our popular Tap ‘n’ Pop is here with new, beautifully created, balloons that are popping out of the screen. New gameplay, graphics, sound… Two game modes and a mini-game! Tap to pop as many balloons as you can to complete a level. Balloons get refilled with a tap on the refill button, but be careful – refills are hard to come by. There are shakes to shake the balloons, pins to pop individual ones, rotations as well as tons of power ups. -Improved device rotation handling, same great result! -New sound engine, sound effects and music! If you like Tap ‘n’ Pop Classic – you will absolutely LOVE the Tap ‘n’ Pop 2! If you never played it before – you should really try it now!